Happy Friday! Congratulations to Christina Taylor (@cetaylor05), who’s won Either the Beginning or the End of the World. Christina, send your address to publicity@lernerbooks.com and we’ll get your book in the mail. Time for a holiday giveaway! 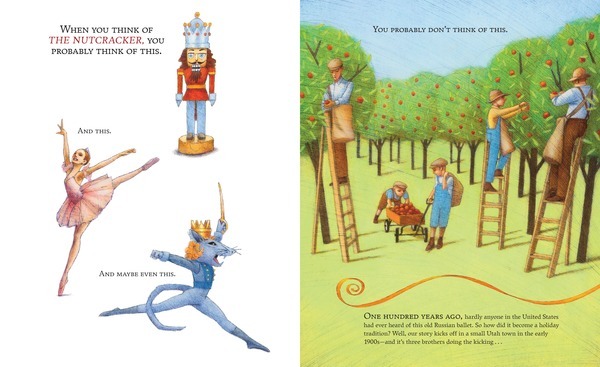 Enter to win a copy of the triple-starred The Nutcracker Comes to America, written by Chris Barton and illustrated by Cathy Gendron. Every December, The Nutcracker comes to life in theaters all across the United States. But how did this 19th-century Russian ballet become such a big part of the holidays in 21st-century America? Meet Willam, Harold, and Lew Christensen, three small-town Utah boys who caught the ballet bug in the early 1900s. They performed on vaudeville and took part in the New York City dance scene. Russian immigrants shared the story of The Nutcracker with them, and during World War II, they staged their own Christmastime production in San Francisco. It was America’s first full-length version and the beginning of a delightful holiday tradition. Make sure to check the blog next week to see if you’ve won! I have heard such wonderful things about this book and have loved Chris's work. Would be a treat to have for sure! This is a great book about a great topic!